“Ramen?” everyone groaned when I brought out the packages of instant noodles on a backpacking trip in Point Reyes last weekend. The wavy blocks of cheap dried noodles have become such a culinary clichÃ¨ in the back country that my companions couldn’t believe the food writer would actually serve them. Chang, the irreverent chef of Momofuku, so loves ramen in all its forms that he named his celebrated Manhattan restaurant for the Japanese inventor of instant ramen, Momofuku Ando. The first edition of Chang’s new quarterly, “Lucky Peach,” focuses on ramen from every angle. He even gets former Gourmet Magazine editor Ruth Reichel to confess in print that she used to serve instant ramen noodles all the time to her son and his friends – in her homemade broth, of course. “That’s genius,” I thought, and set about adapting the idea for a quick pasta primavera. I’ve made the dish before with angel hair pasta but the noodles are so fine, they often clump up when the rehydrated vegetables are stirred in. Ramen solves that problem. The instant noodles also take care of the issue of what to do with water drained off the pasta when you’re cooking without a sink nearby. The noodles drink up most of the liquid and what’s left makes a thin sauce. This dish uses so little liquid that one of my companions was clearly skeptical. “I don’t think that’s enough water for all those noodles,” she insisted. 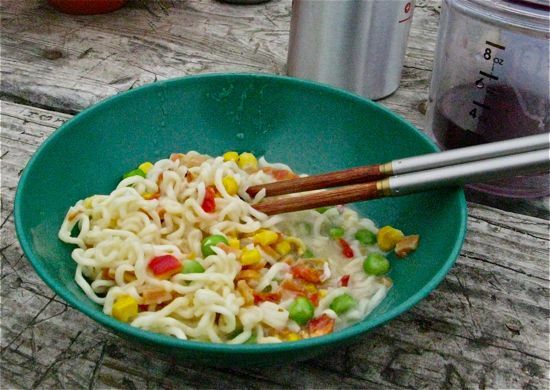 Five minutes later, she had to admit she was wrong as she was slurping up chewy, cheesy noodles with a generous portion of peas, corn, carrots, red peppers and tomatoes. My fellow hikers’ raves more than made up for the earlier razzing. Multiply this recipe by as many campers as you want to feed. It will outshine any packaged backpacker dinner you can buy and the ingredients are very lightweight. There’s only one drawback to this easy dish. Melting the cheese in the liquid creates a sticky glaze that is difficult to get out of the pan. A handy little nylon pot scraper saves the day. In a small bowl, rehydrate dried vegetables in just enough boiling water to cover. Let stand while the pasta water comes to a boil and the noodles cook. Place 3/4 cup water, butter and olive oil in a pot and bring to a boil. Reduce heat to a rapid simmer and quickly stir most of the grated cheese into the water, reserving a spoonful to sprinkle over the finished dish. Quickly add the noodles, stirring with a spoon or fork to break them up as they soften. Cook until the noodles are soft but still slightly chewy in the center, about 4 minutes. Stir in the rehydrated vegetables, sprinkle with reserved cheese and several grindings of black pepper. Eat immediately. Note: I used a package of “Just Veggies” that I purchased at Whole Foods. They’re also available online. Adapted from David Chang recipe for Cacio e Pepe in “Lucky Peach, Issue 1” (Summer 2011). What a terrific quick recipe. I never thought about the fact that the noodle flavoring packets are what makes ramen so nasty. I’m going to try this without cheese and with fresh vegetables and see what I can do–but also in a quick-to-make recipe. Thanks for the inspiration!